The Bluebird Cafe is unassuming. Located in a small strip mall outside downtown Nashville, Tenn., its blue awning wedged between a barbershop and a drycleaners, the cafe’s exterior doesn’t boast airs of importance. Many pass by never knowing that musicians like Dierks Bentley, Keith Urban and Garth Brooks started their careers in this very spot. But the Bluebird is iconically Nashville, where those in the know head to hear up-and-coming songwriters and current chart-toppers, as well as the heroes behind those hits. If you’re not within driving distance of the Bluebird, tune in to ABC Wednesday nights for the show “Nashville,” currently in its second season. You can experience not only the Bluebird, but also other celebrated Music City sights. “Nashville” follows the sagas of country music superstar Rayna James (Connie Britton), rising star Juliette Barnes (Hayden Panettiere) and a group of songwriters and singers chasing down their music dreams. Among the group is Rayna’s bandleader and guitar player, Deacon Claybourne, played by William & Mary’s own Charles “Chip” Esten Puskar ’87. From quiz show contestant to Buddy Holly to Deacon Claybourne, Esten has been in the business for more than 25 years and has worked hard for his success. Whether it’s making people laugh or playing a song in the Bluebird Cafe, Esten’s talent creates an impact with his audience. But how, exactly, does a kid who majored in economics and participated in just one theater production in college end up playing Deacon Claybourne? It was something Esten often heard from his mother, Cynthia Puskar ’63, when he was younger. As a kid growing up in Pittsburgh and then in Alexandria, Va., Esten was a self-proclaimed show-off, someone who liked to make people laugh. When his dad, Charles Esten Puskar III ’63, asked him what he wanted to be when he grew up, Esten said a clown. In fact, Esten did become, literally, a clown, putting on shows with other kids in the neighborhood and performing at local birthday parties — even making it to the International Children’s Festival. Esten’s parents divorced when he was young. Mom Cynthia moved him and his sister, Cathy ’89, from Pittsburgh to Alexandria. She raised her kids while working a full-time job, making sure they had everything they needed through tough times. (l to r) Patty Puskar ’87, Addie Puskar, Chip Esten ’87, Taylor Puskar, Cynthia Puskar ’63 and Cathy Puskar ’89 visit Graceland. Once settled on the band’s name, N’est Pas played everything from the Police to the Talking Heads to Cheap Trick. Esten sometimes played rhythm guitar, but always felt like it made him less of an interesting singer, being planted at the microphone instead of being able to run around like an “idiot,” which Esten found to be more exciting. The group got to play gigs in the Sunken Garden and tour around to different colleges, such as the University of Richmond, Radford and the University of North Carolina. N’est Pas even played some bars in Virginia Beach, which was a real wake-up call. “I remember one night we played down there and there were two people in the entire place, sitting at a table 10 feet from our stage,” Esten said. 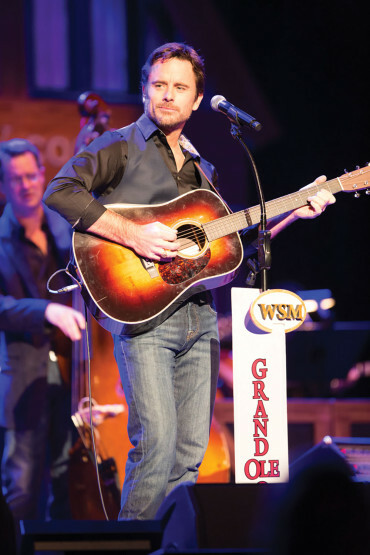 Chip Esten made his debut at Nashville’s Grand Ole Opry in November of 2012. N’est Pas improved over the years and even had a couple of originals that people liked. One of those was called “Walk the Bridge,” which was about the Crim Dell and its infamous legend. Coming from Italy, Patty was an early adopter of the moped. As Esten crooned away on stage, Patty’s friends told her he was singing to her. “I’m like, no he’s not!” But when the group moved across the room to test the theory, Chip’s eyes followed. The two started dating midway through their junior year. Esten had been in L.A. long enough to witness great work and be around great shows and wanted to do something meaningful. He longed for more. As a guest star, he was always made to feel welcome on set, but never really felt a part of the family. “You’re serving a purpose. You’re the situation and they’re the comedy. They’re not able to fully flesh out every single character, so you end up not getting to play anyone that’s as interesting. It became about wanting to do good work and going back to that original feeling of wanting to make people laugh or cry or forget or remember. When the role on “Nashville” came up, it was a dream come true for Esten, who would no longer have to choose between acting and singing. The people that play the backup musicians on “Nashville” are not just extras with guitars; they are legitimate musicians who have toured with people such as Faith Hill and Lee Greenwood. During a wardrobe fitting, a wardrobe staffer was dressing a guy who was a guitar player in Rayna James’ band. She wanted to know how the shirt would look tucked in. “Tucked in?” the guy asked. “You wouldn’t tuck it in?” she replied. During Tennessee’s final JV midstate cross country meet last year, Esten’s son, Chase Puskar, finished seventh, breaking into the top 10 for the first time all season. Esten was supposed to videotape the meet while Patty took pictures. “We were both crying, so I think we got a couple pictures, no video,” said Patty. Esten lives for moments like these with his three kids. And these moments happen more now that the family has moved to Nashville. Taylor, 17, Chase, 15, and Addie, 14, get to have their dad around whether it’s at cross country meets, soccer games or just hanging out in the kitchen.